Based on the popular novels starring amateur sleuth Miss Marple, this current DVD instalment stars Julia McKenzie as the lead character in this highly popular BBC series. For the uninitiated, Miss Marple is an elderly woman who has a knack of stumbling upon mysteries and as per usual, solving them as well. This current story features all the best elements from the book from mystery, intrigue and drama and revolves around the death a wealthy business called Rex Fortescue (Ken Cranham) who suddenly dies in his office as the authorities discover that he was not only poisoned but hand rye in his pocket. Although Rex was not loved too well in the community, hence the lack of remorse from the broader community, things begins to change when his young wife also ends up poisoned. Gladys, the couples maid who was once trained by Miss Marple decides to seek assistance from her old mentor and writes a letter asking for help. Of course, things don’t always go to plan and Gladys is found murdered with Miss Marple arriving too late, however decides to investigate this heinous crime. Interviewing the faithful staff of the manor that include Mr. and Mrs Crump (Wendy Richard), Marple soon discovers that there is more to mystery than just the deaths. Without spoiling the ending or key characters, our geriatric sleuth discovers that these deaths have a connection with the nursery rhyme “Sing a Song of Sixpence” and from here, a deadly game of cat and mouse begins that will leave you guessing in this entertaining and classic BBC tale. Featuring some decent video and audio quality, the transition from TV to DVD has been flawless and this is definitely a disc for viewers who like to think about their mysteries or for fans of Miss Marple herself. 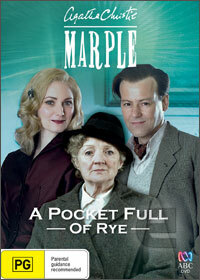 Not the best Marple story but nevertheless, an enjoyable one.